Latin has been part of the fabric of communication in the Western World for centuries. It was the scholarly and administrative language of the ancient Roman Empire in the first and second century BC. Long after colloquial Latin was no longer spoken, as it morphed into the Romance languages we speak today, written Latin still exerted influence for several centuries in Europe as the international language of scholarly transaction. And today its influence is all around us in academic honors, mottos, and scientific and medical terms. Take for example Experienta et Progressus, the Latin motto on the Coat of Arms of the Army Medical Department of the United States Army (AMEDD), which translates to Experience and Progress. Many Latin publications on specialized subject matter can be found in the NLM historical collections, on topics such as astronomy and astrology, plague, sleep and dreams, and even music. During the Renaissance, a period broadly defined between 1300–1700, Europe experienced a burst of scholarly activity in the re-evaluation of the works of ancient Greek medical authorities. 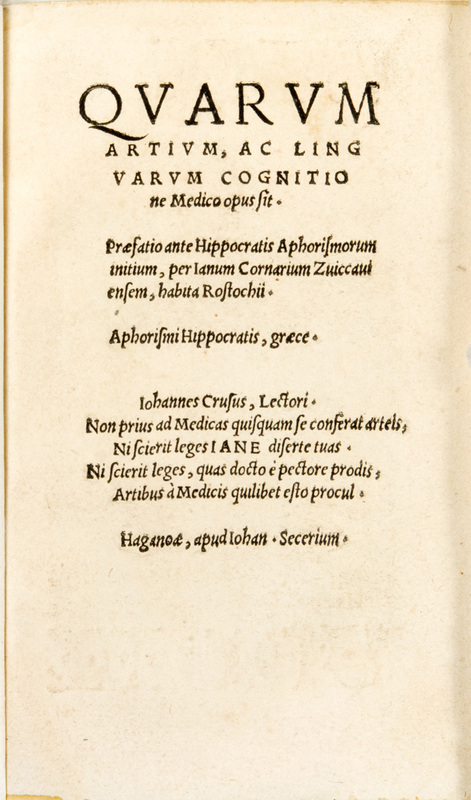 A book dated 1530 held by the History of Medicine Division at the National Library of Medicine on the Aphorisms of Hippocrates is a prime example of this transition of the language of scholarship from Greek to Latin. The text is in Greek but the preface is in Latin. At this time, not all medical scholars could read Greek, but most were equipped to read Latin, and some scholars only knew the ancient medical texts from their Latin translation. The Greek works of Hippocrates and his ilk still exerted great influence in medical spheres but challenges were afoot to these old standby texts. A huge variety of scientific specialization undertaken in Latin began to gain momentum and extend scientific dialog in broader spheres. One example of this development occurred in three German cities, Nuremberg, Augsburg, and Cologne, where legal standards were introduced in the sixteenth century for compounds and simple medicines and each city published, in Latin, a pharmacopoeia. These were official publications carefully compiled by experienced physicians listing medicinal drugs and how to administer them, to be used as reference manuals. The second edition of the Augsburg publication printed in 1573 became the most influential of the three city publications because it was the most thoroughly prepared. Its format is unusual too, being a taller, oblong publication bound in pigskin with metal clasps resembling an old receipt book. It is entitled, Pharmacopoeia, seu medicamentarium pro. Rep. Augustana. Scholia … in Aristo[telis] opuscula is a commentary by Michael of Ephesus on Aristotle’s explorations into the subject of sleep and dreams. It was printed in Venice in 1552 in Latin with references to the original Greek divided into sections covering such topics as memory and recollection; sleep and wakefulness; the loss of sleep; the long and short life; death and life; youth and old age; respiration; and two sections on animals. As with many Latin publications, the title page has a Latin motto In Tenebris Fulgei which reinforces the subject matter of the publication as the motto translates to Gleam in the Dark. This motto was very popular as it can be found on many other title pages in the Library’s rare book collection. Athanasius Kircher, a German Jesuit scholar and an interesting intellectual, had prolific interests and produced amongst his 40 publications in Latin, a work entitled Musurgia universalis; sive Ars manga consoni et dissonie X. kobros digesta… in which the author invokes his ideas on music and how it is reflected by the proportions of the universe. This volume has beautiful musical notations and diagrams of instruments. A famous page from this text presents the musical notes of birdsongs. One of the birds included in these depictions is the rooster, which has a long association with medicine and the Greek God of Healing, Asclepius. The image of a rooster as a printer’s device appears on the title pages of many medical books such as Gabriellis Falloppii, De humani corporis anatome, compendium published in 1571. The same device is copied in the seventeenth century on the title page of Opera anatomica. De formatu foetu. De formatione ovi, & pulli. De locutione, & ejus instrumentis. De brutorum loquela … by Fabricius, ab Aquapendente. The Latin motto inscribed on the device is Non comedetis fruges mendacii which translates roughly in English to mean You shall not eat the fruit of deceit (or untruth). This portrayal of the rooster is still with us today. It is depicted on the Coat of Arms of the Army Medical Department of the United States Army (AMEDD). Atalanta Grant-Suttie is Preservation Librarian for the Rare Books and Early Manuscripts Section in the History of Medicine Division at the National Library of Medicine. Very interesting article! Thank you Atalanta.